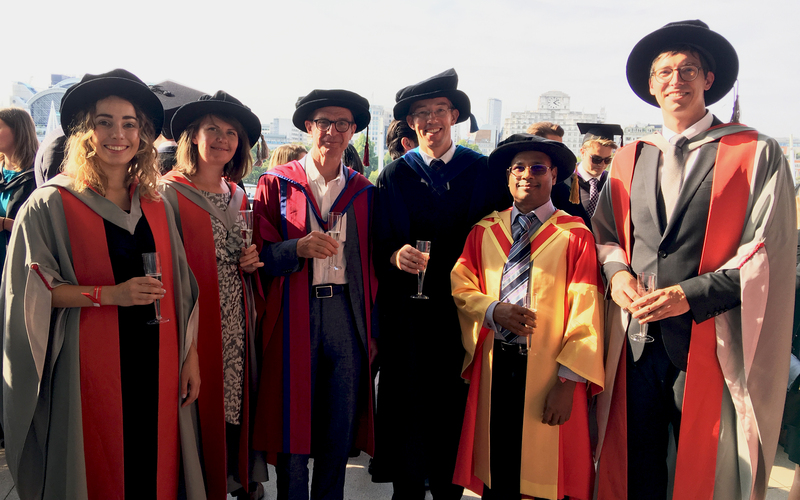 Dr Moira Nicholson, Dr Pamela Fennell and Dr Philip Krammer attended their graduation ceremony to receive the PhDs yesterday. Dr Moira Nicholson wrote her thesis on “What about demand-side response? Using behavioural economics to boost consumer switching rates to time-of-use electricity tariffs – evidence from field experiments”. Her research involved using randomised control trials to test whether insights from behavioral economics could boost switching rates to new types of electricity tariffs which will charge consumers less for the energy that use at off-peak demand. Moira now works at Ofgem as a Senior Behavioral Insights Practitioner. She completed her PhD as part of the London-Loughborough Centre for Doctoral Training (LoLo CDT). Dr Pamela Fennell also completed her PhD as part of LoLo CDT. She wrote her thesis entitled “The impacts of project scale, scope and risk allocation on financial returns for clients and contractors in Energy Performance Contracts – a stochastic modelling analysis” on the factors which effect the success of Energy Performance Contract in schools in the UK. She has since returned to work at UCL Energy Institute as a Research Assosciate. Dr Philip Krammer’s thesis was on “¬International trade and tourism in a CO2-constrained world”. His thesis quantified the resulting changes of real income in the trade and tourism sector in 123 countries with the introduction of market-based measures to combat CO2 emissions on international transport. Philip now works as a Project Portfolio Manager at ÖBB, a mobility service provider in Austria who transports 459 million passengers and 112 million tonnes of goods annually using 92% or energy from renewable sources.